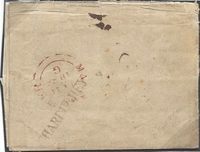 1864 Cover to Palermo, Italy "via France", franked by two 1/- Green, SG 90 and a 6d Lilac, SG 84 and tied by very fine MANCHESTER '498' duplex and part red 'PD' PAID. 1876 2½d ROSY MAUVE, SG 139, PLATE 2, tied to cover to Paris by a very fine Manchester '498' duplex. 1825 ENTIRE LEGALLY SENT TO THOMAS PICKFORD "PER VAN" addressed to Liverpool and redirected to Manchester - Pickford & Co were the great carrier firm of the early nineteenth century. 1794 Entire addressed to Germany from Manchester showing on the front a very fine London circular Experimental 'PAID' datestamp, L 98 - first month of use. Very Scarce.